AFFORDABLE PRICES + GUARANTEED CLEAN, ANYWHERE IN NJ! A1 provides 24-7 sewer services NJ , is an expert NJ sewer trenchless contractor for main sewer repair, sewer line replacement or new sewer line installation, trenchless main linewater and sewer pipe repair and all sewer line services in NJ. We provide any sewer jetting /sewage pump, septic replacement /septic tank removal, underground drain repair in new jersey and nj sewer tree roots removal, pipe belly repair and cleaning for any sewer wastewater drain water supply pipe problems in New Jersey. We are well versed in the latest NJ sewer replacement, repair sewer installation techniques and can provide, fast, affordable, expert sewer repair NJ. Don’t Pay For Unnecessary Sewer Repairs in NJ! Drain sewer issues/problems and repair can get expensive. Get a FREE quote, advice and an affordable price from experienced reputable local NJ sewer contractors. When its come to sewer problems like sewer repair and sewer service solutions we can save you time, money and a lot of aggravation from unnecessary work. We offer same day sewer repair services in NJ and can usually resolve most sewer blockages / sewer backed up problems within 30 minutes. We are a trusted name for all types of sewer services in NJ; sewer repair, sewer replacement, broken sewer lines, water line installation, septic conversion, storm drain connections and main sewer pipe replacement or drain/sewer new installation in NJ. We provide residential and commercial sewer problem solutions with trenchless sewer repairs, sewer pipe replacement, sewer inspection, large commercial sewer system projects and more throughout New Jersey. We promise quality professional plumbing work at a fair price. Sewer problems can cause a lot of stress, we have the experience and training to make sure your sewer service go smoothly. Honest & reliable sewer service. Professional sewer services at the lowest prices. We are local sewer contractors in NJ, so we can serve you faster. Home sewer repair, drain/drainage & french drain installation service, reliable NJ sewer plumbing contractors! The best municipal, industrial and commercial drainage repair, drainage pipes replacement new outdoor underground drainage installation. Our Work Speaks Much Louder Than Words! 24-hour sewer/drain and drainage service. We can provide immediate assistance with any sewer or drain problem, especially to prevent pipe damage repair to your home or commercial building for any Sewer and Drain in NJ. We respond quickly; 24 hours including Sunday, for any emergency sewer service, including main sewer line repairing or sewer clearing, sewer repair and under ground drain video camera, disconnected sewer line, sewage blockage repairs, unblocking a blocked sewer connection and manhole sewer repair problems. In new jersey sewer repair can cost an arm and a leg, even for just a small local sewer repair in nj or sewer replacement in nj. Don’t pay an arm and leg, call professional sewer repair contractors in NJ. Pipe damage, pipe belly, pipe sags, invasive tree roots, corrosion, pipe shifting, pipe crack, pipe collapse. clay pipe, lead pipe, cast iron pipe, polyseal, fiber/orangeberg, PVC, AVS, cured-in-place pipe (CIPP), spray-in-place pipe (SIPP). We are experienced with sewer line repair in NJ. We have completed all types of sewer repair replacement installation in new jersey. can complete your sewer repair quickly and affordable! As long time NJ sewer contractors sewer line repair and sewer line replacement for NJ homes and businesses is what we do every day. Our experience with all types of sewer repair jobs we are never guessing, we usually know exactly what we are seeing because we ave probably seen it before. This means we can diagnose your sewer problem correctly the first time and provide the right sewer service using the most quick and affordable sewer repair techniques available in NJ; including spot repair by sewer excavation, trenchless sewer repair, sewer relining or sewer replacement. Visual inspection video camera inspection can accurately diagnose the situation creating problems in your sewer/drain line. No repair should be done unless we inspect and diagnose that the waste/sewer pipe is damaged or disconnected. With our high tech waterproof plumbing cameras we can conduct a visual inspection of underground pipes and plumbing lines to see if there are any cracks or broken underground pipes. So we can view the condition of your sewer lines, septic lines, water lines or other underground plumbing lines without tearing up your walls, cement floors or other parts of your property foundation. You may need to repair or replace a collapsed, broken damage cracked sewage pipe, a sewer belly or tree roots in your sewer line. We can tell you exactly where the problem is and what it is and fix only what needs to be fixed. That allows us to provide affordable and fast sewer service in NJ. There are a variety of methods to repair sewer problems and as professional NJ sewer contractors we possess all the necessary up to date plumbing equipment, training and experience to solve your sewer problems effectively and affordably. Some companies specialize in one method of sewer repair / replacement, like pipe bursting, and will try to use that method the most often because they have invested in the equipment or it is the easiest for them. Though sometimes it may not be necessary to replace your entire sewer line if only a small area of the sewer line is broken. If the broken segment of sewer line is in your yard or another easily accessible are it is often easier and cheaper to excavate the damaged sewer pipe and replace it. Spot excavation for sewer repair of a small area of a damaged sewer line can usually be completed in one day with minimal hassle to the home or business owner. Stop tree roots blockage in sewer and drain – Tree roots in your drain can cause sewer flooding and severe damage to underground sewer lines in New Jersey. 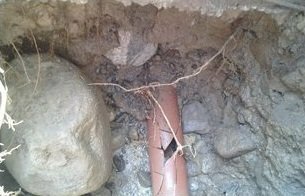 Tree roots can creep around the surface of the pipe wall and grow into the pipe, blocking off the flow and causing the underground pipe to leak or crack. We use the latest sewer cleaning technology to remove or kill tree roots in a sewer line. If your sewer pipe is cracked or broken from the tree roots, we can use local excavation to replace the broken sewer pipe at its exact location or sometimes we can use trenchless sewer repair methods to remove tree roots and repair the cracked underground pipe without excavation. 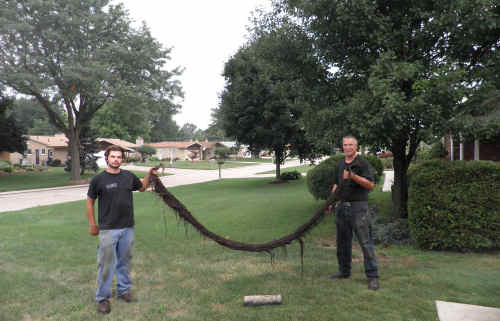 Got tree roots? No worry! We are a leading provider contractor company of sewer repair and sewer replacement services in northern New Jersey. 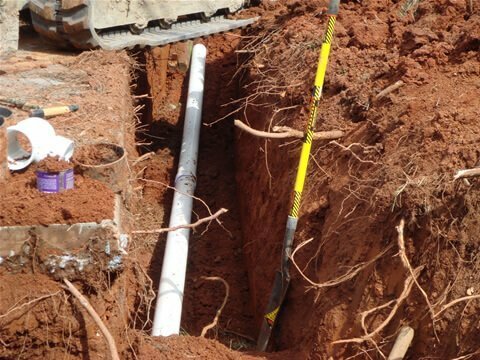 We service a wide range of residential commercial municipal clients with sewer service needs, including sewer repair, sewer replacement, new sewer line installation, septic, excavation and drain line tree root removal. When excavation of your nj sewer line is needed call the best NJ sewer excavation contractors for fair quote and quick clean work. 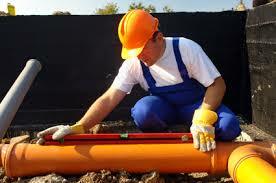 Any sewer, drain or under ground pipe excavation sewer line, gas pipes, main water line repair to complete replacement. Replace old cast iron with new in a matter of 1 day. Need excavation in order to dig up the sewer pipe line, remove old cast iron pipe or relocate replace existing pipe or new installation? We offer you an easy way to complete any sewer repair in new jersey quickly and affordably! When sewer replacement is complete we fill up the trench we dug and repair it to the way it was before, either repairing the landscaping on the lawn or paving your driveway new. Our NJ drain and sewer plumbers have been doing drain and sewer repair in NJ for years, we can do same day sewage line replacement in NJ, start to finish professionally and cleanly. a trench to repair your broken sewer pipe lines and destroying your landscaping, driveway, patio or walls. Instead of digging up areas of your property, we use the existing small access points of the sewer line for underground sewer pipe relining. We can restore just about any damaged pipe using trenchless sewer pipe lining and it will take a few hours not weeks at a much more affordable cost than traditional sewer pipe repair with excavation. Your relined sewer pipe should last you at least another 50 years. Contact us to discuss your nj sewer repair options. Sewer pipe relining is a method of sewer repair in nj whereby we use the existing accesses to the sewer line to re-line all or a portion of your sewer pipe line with a durable sleeve, resulting in easier and cost saving sewer repair or sewer replacement for the entire sewer line. We are trained and experienced in providing the most innovative and efficient plumbing repair services on the NJ market. We have provided trenchless sewer repair and pipe relining to our new jersey clients for many years, making us a leaders and experts in this innovative sewer repair solution. If your line is damaged and you need sewer repair or sewer replacement in NJ, let us to reduce your cost and time by using re-lining technology. Call the NJ trenchless sewer contractors that specialize in a variety sewer damage solutions for all NJ sewer problems. Don’t pay an arm and a leg for main water line repair or water line replacement in NJ. Our FREE estimate and honest advice can save you hundreds or sometime thousands of $$$ when it comes to main water line leak repair, a collapsed sewer pipe or a broken water pipe. Most NJ plumbing companies don’t do main water line repair in new jersey that often. As a long time nj sewer repair company we handle water line repairs in new jersey very often, many times a year. Call us for a free estimate and advice. We have conducted main nj water line repair and replacement many times and can give you a good idea of the procedures involved, the timing and the cost. Don’t get stuck with delays, overpaying or worse, an abandoned plumbing project because of a NJ plumber without experience, call us today and get your water line repaired in NJ quickly and affordably! Storm drainage installation on New Jersey properties are common to prevent the collection of rain and stormwater in front/backyard on the landscapes of homes and buildings, streets, driveways and parking lots. Several different storm drains are usually installed on a property as well as in the street as part of a complete outdoor storm drainage system to collect and redirect rain or stormwater runoff into the NJ town’s storm drain system. When a storm drain become damaged, it’s important to call a NJ drainage contractor for storm drain repair immediately, especially if it is the rainy season in new jersey. Drainage backups and storm drain clogs can cause water to collect and overflow onto your landscaping, parking lots and basement causing flooding. In some cases broken storm drains that are in need of drainage repair for a long time can lead to broken septic tanks and damage to a building or home’s foundations. Ineffective storm drainage can be a liability for your NJ home or business, call us today to discuss drainage solutions for your property or to get your storm drain repaired in NJ right away. At A1 we offer the most reliable and fast 24 hour emergency drain and sewer services in New Jersey. We are a residential and commercial NJ plumber offering a broad range of drain and sewer service solutions in NJ, with around the clock 24-7 NJ emergency plumbing services. Our plumbing technicians have the technology and experience to locate and fix your sewer pipe and drain lines problem quickly and to your satisfaction. Our service technicians are selected for their experience in sewer repair and a high level of training in order to ensure we always provide quality sewer and drain repair and can do it at an affordable price. When you need a sewer service contractor in NJ or a drain service contractor in NJ call A1! We are experts in NJ sewer drain wastewater, water supply line plumbing. Home sewer clogged & sewer line repair NJ drain service. Sewer camera/video inspection service NJ. Sewer repair without excavation (Trenchless) NJ. Trenchless sewer line replacement NJ. Trenchless main sewer pipe installation NJ. Commercial sewer & commercial drain repair service. Jetting services in NJ, home and commercial. Sewer pipe repair services NJ. Pump installations & pump repair service NJ. 24 Hour emergency plumbing sewer drain services . Faster and Easier; With the best of NJ sewer repair sewer replacement sewer installation and drain repair drain replacement drain installation services, sewage leak repairs, debris or catching dirt or sewer smell, Working with A1 NJ sewer services has now become even faster and easier. All our NJ plumbers are fully equipped with the latest requirements. Our plumbing technicians are experts in sewer and drain repair in NJ, they all have the years of training and experience to determine what the most affordable and effective options are for repairing a pipe or replacing a pipe. We update our training & knowledge with all the latest methods for plumbing pipe repair, sewer camera CCTV video scope inspection, excavation, trenchless sewer repair, we’ve done it all hundreds of times and know how to get any sewer plumbing job done quickly and efficiently.